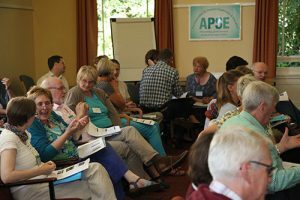 The 2016 Conference was held from Wednesday 21st -Thursday 22nd September, at Woodbrooke Quaker Study Centre, Birmingham. This was our first residential conference – and the benefit of overnight accommodation made for a much more relaxed experience, with more “in between” spaces for members to talk and fellowship at a deeper level. Though it was barely 24 hours together it was so good to reconnect with a number of colleagues, some of whom I hadn’t seen for many years, to meet some new people, to network and to deepen present collegial relationships… Thank you to Jane and the APSE team for a healing 24 hours. 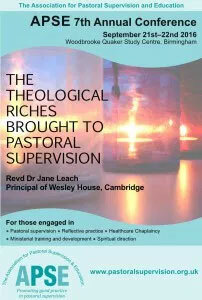 Our topic was “The Theological Riches Brought to Supervision”, with keynote speaker Reverend Dr Jane Leach, co-author of Pastoral Supervision: A Handbook. As well as the main sessions, Jane led interactive and seminar sessions over both days. …through Jane Leach’s skill, insight and humour, her three presentations were thoroughly stimulating. One of the great strengths of the conference was that there was a flow and continuity that was in part possible because Jane was able to help us ground and closely accompany us in our reflections. We had a great mix of attendees, with lots of familiar faces, and some who are new to the specifics of pastoral supervision – often bridging the gap with other disciplines. We aim to create a supportive environment where practitioners at all levels will be encouraged towards professional growth and excellence. This was my first APSE conference. I was delighted to meet many new people. The conference was a great way to begin to learn the language of pastoral supervision… As I continue to consider Jane Leach’s well presented lectures I am excited about cross-disciplinary dialogue and the increased depth of theological richness we can gain. The feedback from attendees was very positive, and the overall sense was that APSE is going from strength to strength as we continue to grow and develop. It was a very encouraging time, and we hope you will join us next year! It felt that APSE was in a stronger place, more buoyant and confident as an organisation than in previous years.